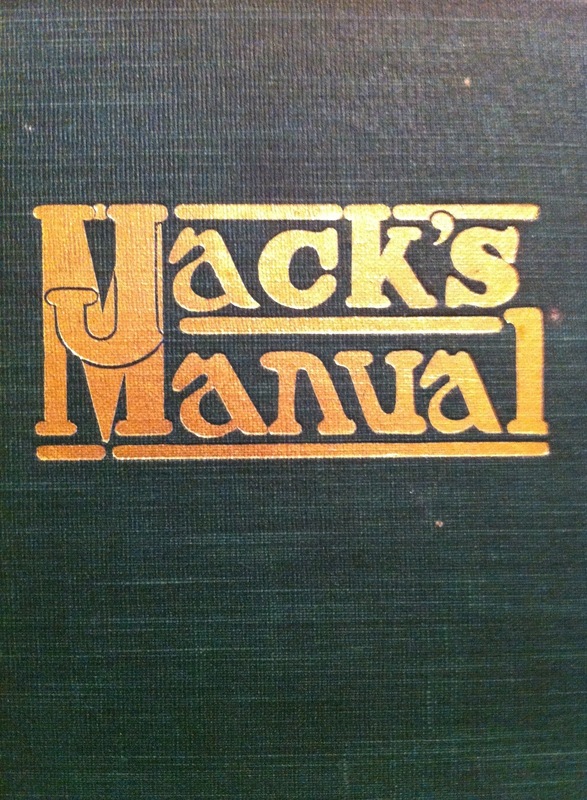 The Brooklyn cocktail comes from a very rare 1908 title by Jacob Abraham Grohusko entitled Jack's Manual. The drink's merit is obviously endorsed by how quickly the recipe spread, and it's continued popularity to this day...well...maybe I shouldn't be that hard on it. In fact, this drink, though it has had its followers, was never that popular of a Manhattan variation and it shows up only here and there over the years. Since this recipe is a personal favorite, I'm going to go into a little more depth with this one. 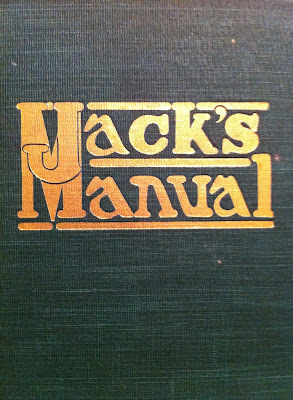 I'll feature the Jack's Manual recipe later as the base for my recommended recipe, so let's start with Jacques Straub's 1914 recipe in Drinks (once thought to be the earliest recipe) and work up from there, checking in on the recipe here and there as it has aged. Frank Meier took a stab at it in 1936 in The Artistry of Mixing Drinks, interesting for a Paris bartender to leave out the Amer Picon! By 1948, Embury's take indicates that the Brooklyn's popularity had obviously begun to fade. It appears in a few modern books, though not many. Robert Hess changed the dry vermouth to sweet in his 2008 title Essential Bartender's Guide. 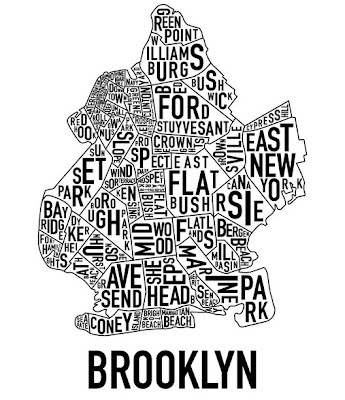 Though I'm sure it would work, I think it would technically be a "Sweet Brooklyn". 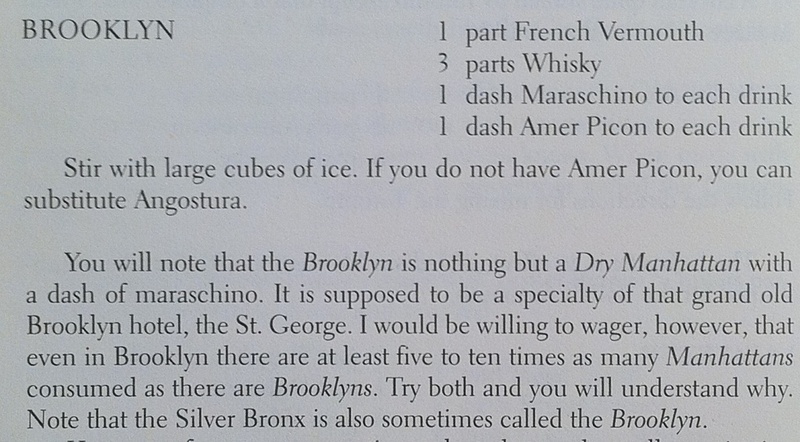 Mr. Boston's also lists their recipe with sweet vermouth. Most of the recipes though time call for a 1:1 or 2:1 ratio of rye to vermouth. 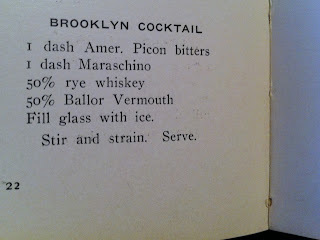 Ted Haigh in "Vintage Spirits and Forgotten Cocktails" includes a recipe with dry vermouth, but his adaptation calls for using 2 oz of rye and only 3/4 oz of dry vermouth, using enough vermouth I suppose to make it a Brooklyn - but we're getting further away from this drink's roots. Rye and dry vermouth...apparently not the most popular mix! That's really what this drink is all about though. If you are not into the base spirits, then this drink is likely going to fall flat for you. If you are lucky enough to have a bottle of real Amer Picon, then you can make a real Brooklyn. At only 1 dash though, its flavor is really in the background. A century ago when these recipes were written, Amer Picon was made stronger than it is now. 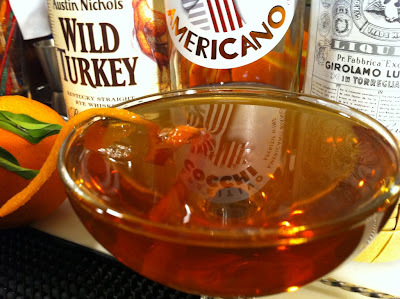 So you can add more of it if you like, and remain true to the original creations, which is why the amount of Amer Picon in my recommended recipe below is larger than the amount of maraschino liqueur. 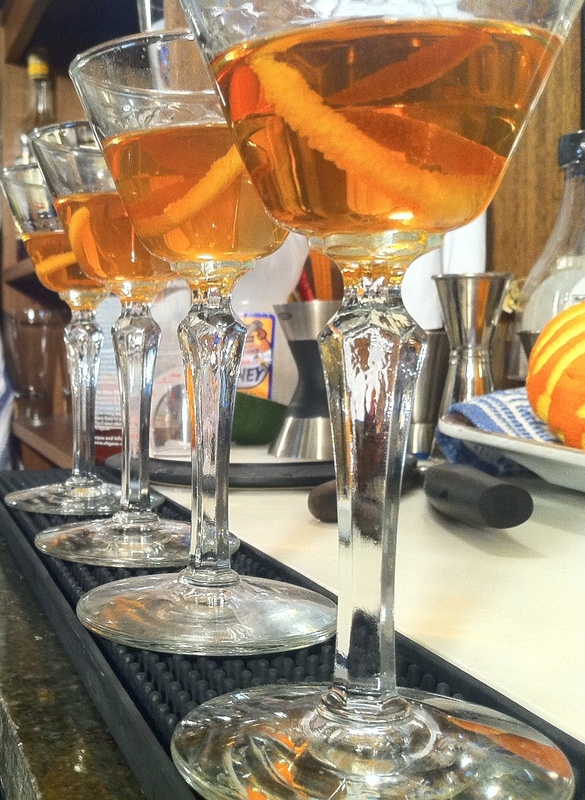 Stir and strain into cocktail glass, garnish with an orange twist. I'm going to follow suit here with previous authors through time by making a few slight adjustments to make this drink more to my liking - while trying to stay as true to the 1908 original version as possible. I'm not sure what the flavor profile of "Ballor" was, but I did some experimenting to help me dial in my own preferred ingredients. I've enjoyed this drink many times on its own, but here was a chance to make a batch for side-by-side comparisons. I started by making this recipe with Noilly Pratt, Lillet Blanc and Cocchi Americano against Rittenhouse bonded. The Noilly was of course the driest of the bunch. Though I had a better sense of the Rittenhouse with this combo than the others, and liked how it allowed the rye's flavors to shine through the mix. The Noilly's flavors managed to hold up well to my "generous" dashes of the Maraschino and Amer Picon. This combo is perfectly enjoyable. Especially if you have developed a taste for dry vermouth, as its flavor comes through well in this variation. I would recommend Lillet blanc for the wine lovers out there, as the sauvignon blanc and semillon grapes in Lillet's base show up nicely here. It was a a mid-point between the Noilly Prat & Cocchi in terms of dryness. The Cocchi was like a big wet kiss after trying the first two. Round & luscious with even more of a silky mouth feel than the Lillet, here was a very drinkable variation. Cocchi is not always my favorite choice, it is a little "off" in many combos for my palate. As with many bottles worth having though, when it works, it works really well! The fourth in the lineup was made with Wild Turkey 101 rye and Cocchi Americano. Here was the mix I was after. It was the most "Manhattan-ish" of the lot. The Wild Turkey rye's bigger oak profile worked well to tame the Cocchi down for a nice balance. In turn, the Cocchi smoothed out the rough edges of the whiskey, while retaining its bitter, citrusy profile without overpowering the whiskey to the point that it had with the Rittenhouse. The flavors of the Maraschino and Amer Picon come through as well, but are not overpowering. There was something new here as well, the whole being greater than the sum of its parts, which is always the hallmark of a great cocktail. The Wild Turkey/Chocchi on a 1:1 ratio was how my palate found the Brooklyn best to its liking, but these were all enjoyable combinations. 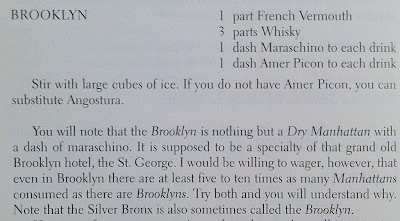 I guess that's why the Brooklyn is a favorite of mine and many others - it's a flexible drink that offers many different experiences. Including hopefully, a favorite combination for you as well. Though I don't have Amer Picon, so I used Ramazotti, with Rittenhouse and Lillet. I might give old overholt a try, or I have some Jim Beam rye as well, no Wild Turkey. I have some other Amaros as well (Averna, Montengro and Cio Ciaro). I will have to fool around with this too. Was there someone there to help drink all those cocktails? Hi Drew, You might try the Jim Beam next. The Wild Turkey Rye is fantastic and worth seeking out. 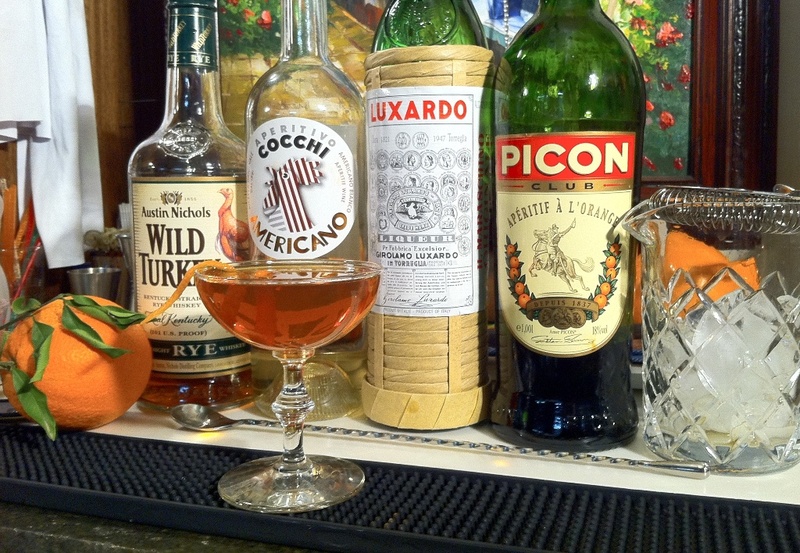 To sub the Picon, Amaro Cio Ciaro is going to be the closest match. The Cio Ciaro is lighter in texture and heavier on the herbal flavors and finish. I love the Cio Ciaro but compared to the Picon it seems muddy. Add some Angostura orange bitters to the Cio Ciaro and you'll be a little closer. (For this recipe maybe a drop or two of bitters into the 3/4 tsp of cio ciaro). Real Picon has a light, fresh brandied orange flavor that's way out in front of its herbal profile and remarkably easy to drink on its own. Hopefully someone will make a deal to import it to the US soon - apparently the distributer in France does not think the US "worthy" of exporting to these days. 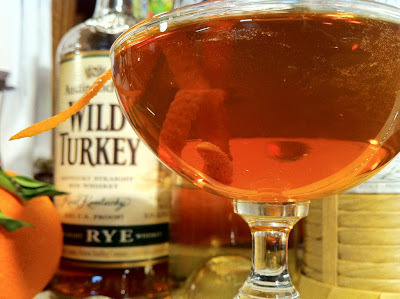 I will search out the wild turkey rye as I have been drinking a lot of rye in various forms...I have Fee west Indian orange and Regan orange, one more bitter is always welcome. The recipe you posted here is very different from the one on ohgo.sh, it is like a different drink altogether. Not sure I wanted that much lillet in mine, but will try to find the Cocchi Americano and give this version another try. Hope you came up with some ice last night! Really for the money (Should run you around $25) the Wild Turkey is an exceptional buy. Great for old school recipes too with it's high proof and big flavors. O'Gosh's recipe is a more modern adaptation, along the lines of Ted Haigh and Robert Hess's adaptations. With normal dry vermouth, it is probably the way to go, but even at 1:1 with fresh Noilly Prat I found the drink enjoyable. I was going for something truer to the original however, which is why I experimented with the different apretif wines. I would not agree at all with Ramazzotti as a Picon sub though - it's an amaro, but there are a wide range of amari and the two are not very close in flavor. It would be better than nothing - but you would still want to add healthy dose of orange bitters as the Picon is all about the orange flavor. (Reagan's would be OK, but the Angostura orange has an amazing fresh citrus oil aspect that's hard to beat). My snifter got some good use last night, and I have plenty of good frozen water again for tonight, Cheers! 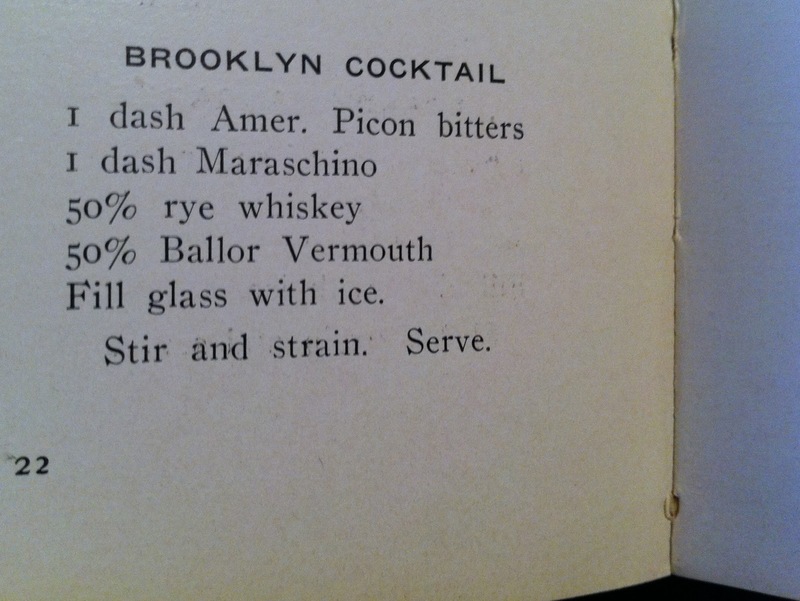 In old South American books, 1922, 1924 and 1936, appears in different recipes of Brooklyn the tipe of vermouth change, but always is made with the Amer picon and marraschino , in some of the recipes the amer picon is replaced in for Fernet Branca. Argentine bartender Manual 1922, written by the Association of Argentine cantineros( bartenders),El coctelero argentino 1919,Manual del bar (1924)by antoni fernandez, Cocktails (1936) by Raymond Porta MINGOT. Just made my first true Brooklyn tonight after receiving my Torani Amer in the mail...was looking forward to this, and was not disappointed at all. I used Bulleit Rye (2 oz), Noilly Pratt Dry (.75 oz), and 2 tsp each of Picon and Maraschino. The drink took on a manhattanish appeal, but with a very nice zest. The rye as base stood out, but did not overpower. The Picon and Maraschino combined nicely particularly as a bouquet while drinking.